On "Open Here" three of Gothenburg's most noted jazz musicians, Anders Kjellberg, Göran Klinghagen and Staffan Svensson join together under Kjellberg's leadership to create trio music of a very unusual character. The combination of drums, guitar and trumpet (using electronics) produce fascinating sound pictures and interpret original compositions as well as John Coltrane's "Naima", Jimmy Rowles' "The Peacocks" and the evocative film music "Marlowe's Theme". 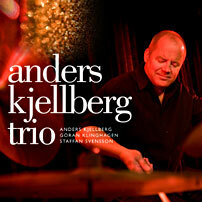 Anders Kjellberg has been active on both the Swedish and international jazz scenes for almost 40 years. His drumming is unique and unmistakeable. Naturally one can hear references to such iconic drummers as Elvin Jones, Tony Williams and Jack DeJohnette, but these influences are integrated into a personal approach to the drummer's role that is all his own. Many listeners to jazz have probably become familiar with his playing by way of the Lars Jansson Trio in which he has been an inspiring member for thirty years. He has brought energy to the music and created dynamic possibilities in the art of improvisation. Those who have followed Kjellberg's career with interest know him from groups such as Entra Cameleon, Mount Everest, Opposite Corner, Änglaspel and Dr Dingo - all of them based in his home town area of Gothenburg. Over the years, he has collaborated frequently with bassist Palle Danielsson, beginning in the '80s in the Swedish supergroup Rena Rama with pianist Bobo Stenson and saxophonist Lennart Åberg. During the '90s, the group was engaged in projects with, amongst others, Don Cherry and Kenny Wheeler. Among Kjellberg's international engagements have also been collaborations with Rita Marcotulli, Dewey Redman, Tomasz Stanko, Steve Swallow and many others. A significant number of engagements with prominent Norwegian jazz musicians, for example Jan Balke, Tore Brunborg, Ståle Storlökken and Terje Gewelt, are also on his merit list. His fellow-musicians on this CD "OPEN HERE" also have their roots in the Swedish west coast metropolis, Gothenburg. Guitarist Göran Klinghagen's versatility can be exemplified by his involvement in everything from the fusion band Hawk On Flight to projects with many of Norway's most well known jazz musicians, such as Jon Balke, Jon Christensen and Arild Andersen in the group Masqalero, and such Swedish luminaries as Eje Thelin and Anders Jormin, just to name a few. He has also played with Kjellberg (and Palle Danielsson) in many different constellations. Klinghagen's current projects are with his own group Triometrik and the Swedish/German collaboration in the group Tovego. Staffan Svensson's personal trumpet playing has been attracting a growing amount of attention during the last decade. His style of playing and form of expression cover a broad spectrum from acoustic and electro-jazz to experimental art music without borderlines. This has resulted in collaborations with the foremost Swedish and Norwegian jazz musicians. His contribution to pianist Andrew Hill's Octet, when Hill was awarded the Danish Jazzpar Prize in 2003, received much praise. Currently, one of his own projects is the electro-acoustic trio SounDance. This CD has been produced in conjunction with the stipendium that Laila and Charles Gavatin's Foundation for Jazz Music present annually and which this year has been awarded to Anders Kjellberg. Most of the music that the musicians create on "OPEN HERE" is made up of original compositions by the group's members. There are also fresh and unusual versions of three relatively well-known themes: John Coltrane's "Naima", the moody detective film music "Marlowe's Theme" and pianist Jimmy Rowles' beautiful composition "The Peacocks". There is much to listen to here and the interaction between the three musicians is impressive. But above all, Kjellberg's ability to create a steadily shifting foundation for the sounds, themes and improvisations holds the music together in a masterly way. My sincere thanks to Laila and Charles Gavatin for making this recording possible. Very special thanks also to Göran, Staffan and Åke for their positive attitude, enthusiasm and great musicianship.